DSM Dyneema successfully develops DM20 to register new milestone for deep-sea oil and gas exploration. DSM, producer of the world strongest fiber, has recently introduced DM20, a new fiber designed for the production of incredibly strong ropes that provide unrivalled strength, stiffness and durability. DM 20 was developed for the production of deep water mooring ropes for deep-sea oil and gas production facilities. With a significantly smaller diameter than polyester, low creep, high fatigue resistance and weightlessness in water, mooring ropes made with the new DM20 grade from DSM Dyneema offer benefits across planning, system design, logistics, hook-up and installation stages. They guarantee maximum strength over a maximum lifetime, as well as faster handling and improved safety - leading to greater effectiveness and efficiency according to DSM. DM 20 is an innovative fiber that completely redefines the capability of HMPE ropes and forms the basis of Dyneema Max Technology. Rigorously tested, these ropes are ideal for all rope applications requiring resistance to permanent loads. 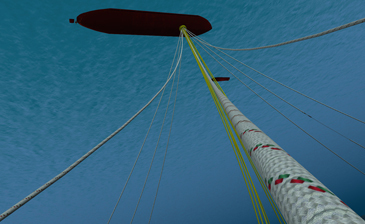 Over ten years ago, DSM and Lankhorst Ropes teamed up to develop technically advanced ropes, and some years later they decided to focus on mooring systems for use in deep water. Working together, the companies initially demonstrated the benefits of HMPE mooring ropes for deepwater Mobile Offshore Drilling Units (MODUs) with SK78. SK78 is currently the only HMPE fiber certified for use in deepwater MODU applications. More recently, DSM developed DM20, a new grade of fiber that has the strength and flexibility required for the production of rope capable of enhanced performance in permanent deepwater and ultra-deepwater moorings.